Black rot of sweetpotato is caused by the ascomycete fungus Ceratocystis fimbriata. C. fimbriata can infect several woody plants such as fig, cacao, mango, coffee and eucalyptus. For a complete host list please visit the USDA Fungus-Host Distributions Database. However, it is believed that isolates of C. fimbriata are mostly host specific, thus, in the case of isolates infecting sweetpotato (Ipomoea batatas), isolates infecting morning glory (Ipomoea spp.) constitute the most likely source of inoculum. Symptoms generally are seen at harvest, after curing or after storage and consist of a dry, firm, dark-colored rot that does not extend into the cortex of the sweetpotato root. Infections typically begin at wounds, lenticels, or lateral roots and can expand in diameter during storage. Examination of infected tissue with a hand lens may reveal the white mycelia and black perithecia of C. fimbriata growing on the lesion surface, which is a key diagnostic feature of black rot. If infected roots are bedded for transplant production, symptoms may also appear on plants in the bed or after planting. Infected slips develop dark, sunken cankers below the soil surface and severe infections can result in the stunting, wilting, and even death of sprouts. Dark, dry lesion on sweetpotato typical of black rot caused by C. fimbriata. Black rot typically does not extend past the vascular tissue into the inner cortex of the sweetpotato. White mycelia and black perithecia as observed at 8x magnification, characteristic of C. fimbriata. 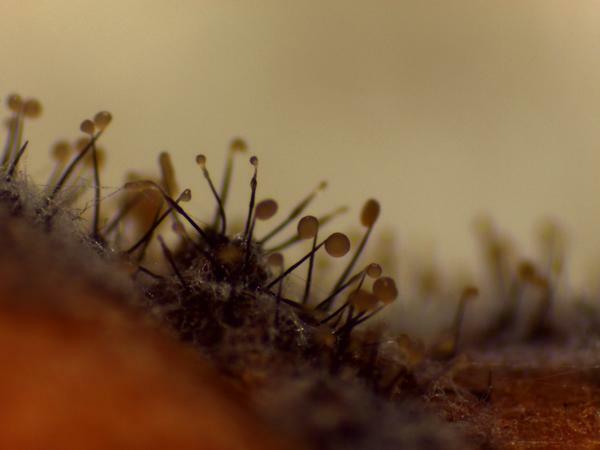 Black perithecia at 25x magnification extending from the surface of a black rot lesion. Temperatures ranging from 23-27°C in the field. Soil moisture levels of -0.1 to -0.2 bars. Presprouting of roots at warm temperatures. Black rot is typically transmitted from infected parent material (roots or slips), infested soil, infested equipment, and some insects. Bedding roots that are infected with black rot can result in pathogen transmission to slips and then onto the subsequent sweetpotato roots. C. fimbriata can also survive in the soil for several years or on the roots of wild morning glories due to the formation of overwintering spores called chlamydospores. Infections can also take place on wounded sweetpotatoes during washing and packing if any equipment or wash tank is contaminated with the pathogen. 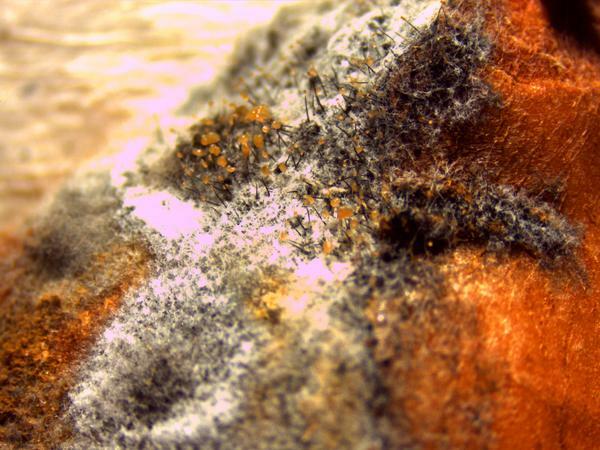 Some insects have also been found to move the sticky ascospores on sporulating black rot lesions that produce a fruity odor and attract insects. Debris should be removed from bins prior to use. Wood bins can be sanitized by heating at 110°F for a minimum of 24 hours. Plastic bins can be washed with chlorinated water. No fungicides are effective at controlling this disease after black rot has become established but products can be used to protect seed and slips. The active ingredients thiabendazole and difenoconazole have shown good efficacy for controlling black rot. For the latest fungicide recommendations for sweetpotato black rot see the Southeastern US Vegetable Crop Handbook. Fungicide labels are legal documents, always read and follow fungicide labels. Currently no OMRI products are listed for control of black rot in seed beds. However black rot has been successfully controlled in the past through the use of proper management practices as listed above. Black rot has been successfully controlled in the past through the use of proper management practices as listed above. This factsheet was prepared by the NCSU Vegetable Pathology Lab in 2014.